Home/blog/Love it. Love it, not. Tattoo Regret? With more people regretting their tattoos, laser technology finally has given us a better answer to the unwanted tattoo. With the discovery of the picosecond, laser tattoo removal has greatly improved. The first laser called the Picosecond was release in 2013, however it has limitation with colors such as red. With the increasing popularity of tattoos in this country, technology for removal has been very limited. For 8 years, I used a Qswitch laser called the Medlite 6 to remove tattoos. At the time, it was the gold standard for tattoo removal and I personally treated the most people in this area. 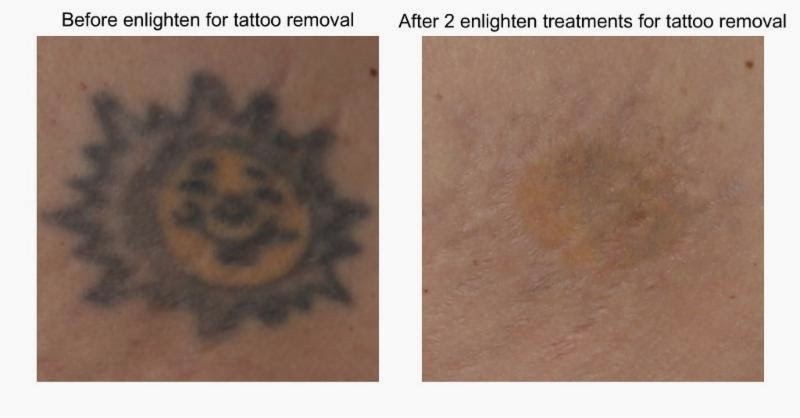 However for those individuals that experienced tattoo removal during this time, it took up to 15 treatments to clear the tattoo. The treatments were done 4-6 weeks apart, therefore, this was a 2-3 year process. In addition, black and red tattoos were easily removed, but colors such as green and blue were much more difficult to treat. The laser company, Cutera, improved this technology and developed Enlighten released early this year. With the Enlighten, we can address the full spectrum of color with the most powerful laser on the market today. With this technology, we decrease our treatments from 10-15 to more like 3-6. A: The total number of treatments vary depending on the composition, depth and color of the ink, as well as the size. You should be prepared for multiple treatment sessions and your provider can give you a better idea of the number of treatments needed. A: Tattoo ink is deposited deep in the skin. In order to reach all of the ink in the skin, multipple treatment sessions are needed for clearance. A: In many cases,yes. However it is very important to know that some ink colors are more difficult to clear than others. A: Patients compare the procedure to a rubber band being snapped against their skin. Q: Are there any side effects or downtime? A: Most patients experience temporary redness and swelling immediately following the treatment. Patients may return to regular activities immediately following the treatment.